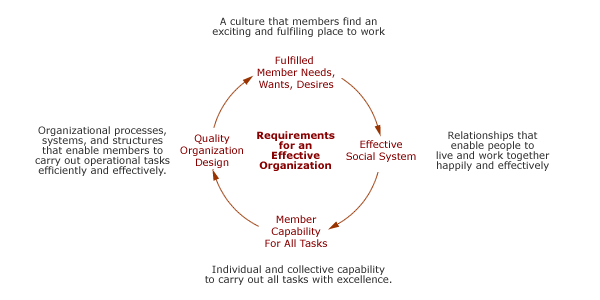 In EO terms an organization is a system of people that carry out a system of tasks. Together, these two systems make up an enterprise, business, or company. The organization members provide the capabilities and energy to make the enterprise function. Therefore, EO work reserves the term "organization" for the human system. It uses words like enterprise, business, or company for the combination of the organization and the system of tasks its members perform. EO's work is based on a conceptual framework for thinking about how people come together in organizations to produce results and outcomes. First, individual and collective human capability creates all results and outcomes. 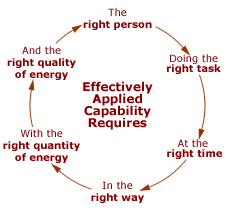 However, to have the results and outcomes we want, this human capability must be applied effectively. It takes an effective organization to meet these requirements.